Sophietje came to us in July 1994. She was our first Westie. After showing her a few times we wanted to breed a litter with her. Her first puppies were born on July 9, 1996. A litter of 5. From then on, the Westie virus struck. Charlotte stayed with us and one year later Rose. We then lived in "the high north" and had a lot of space. 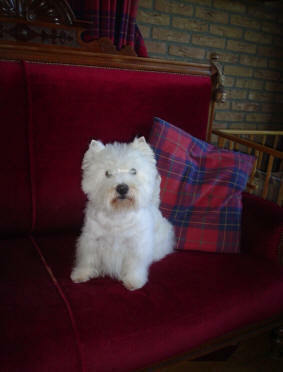 There came still some more Westies in our lives and Sophie always has raised them. That was her life. Gradually she became older and therefore less interested in the younger Westies. Her second love was eating. She was crazy about food, especially when I made "Prutje" (lamb heart with vegetables and rice). Then she was all afternoon in the kitchen waiting for it to cool down and all other dogs were chased out of the kitchen. She continued doing this till the end. The last 6 months she became really old. She could not go down the stairs, and a few months later also no longer go up the stairs. She was deaf and if she had to urinate, she had to go right away and so urinated in the room. She had a mild epileptic seizure at the end of September. After 5 minutes it was over and she was acting normal again. She had a horrifying dislike of veterinarians (left over from fertility research) and we decided to do no further investigations. She also had no problems anymore. On November 3 she got another attack, this time much longer. She got into a coma and her heart stopped. She died in my arms. You were born on Saturday October 17, 1998. You were the first puppy and got a brother and a sister. You weighed 170 grams and drank equally well and grew 30 grams per day. On the third day, you choked and continued to simmer for a few days. You also got a very wet nose, we therefore called you "Snotsmurf", but according to the vet nothing to worry about. When you were 3 weeks old we went to the vet again. He then looked with a probe in your throat if you had an open palate, because you still snorted. Fortunately, everything was fine. You grew very well, got your first worm cure and with 6 weeks your first injection. You did not even peep and they listened to your lungs for a while. Fine according to the vet, but I myself had my doubts. You were different than your brother and sister. When you were 7 weeks old, your new owners came to see you. We had postponed this as long as possible, but after 6 weeks the snotting was over. We agreed that they came to pick you up in the new year. On December 19 your second injection. In the meantime you snorted again and I expressed my concern to the vet. He responded with: "oh, those breeders are always so overconcerned". According to him, nothing to worry about. On December 20 your brother and sister were picked up and you were together with the other dogs and our German shepherd puppet Finn. On Christmas Day we celebrated with packages under the Christmas tree. You loved it and took out all the dog packages. In the afternoon you could come along for a visit with Finn. You thought everything was great and went straight to the door when you had to pee. In the evening at 22:00 we were back home and you were finished. On Boxing Day you became ill and you only wanted to eat special food. On December 27 we went to a special veterinary clinic with you because our own veterinarian did not have my confidence anymore. There they found a double pneumonia and a greatly enlarged heart. Your chances were small, but I wanted to try it. December 30: Back to the clinic - the antibiotics hit and we get hope. January 8: Control photo made and again well improved and we switch on another antibiotic. January 15: It is fine and you are terribly naughty. Together with Finn you sometimes catch a chicken which of course is not allowed, but we are happy that everything is going well. You dig out the hornbeams and chase the sheep through the fence. In short, you entertain yourself well. February 2: We go to the clinic to have the other dogs vaccinated and you also go with us. You are being examined and it appears that you are doing so well, that we also give you the Cocktail vaccination. You still get medication anyway. February 12: The last pill today it gets exciting. February 13: You play all day, but you are tired a little earlier. February 14: When I get you out of the bench in the morning, I know it's wrong. You snotter again, are very short of breath and have a high fever. You quickly did a pee and want to be on my lap. You shiver and pant and I get a very scared feeling. Animal clinic called and there too the defeat is great. We can come right away. Sweet Smurf, there was nothing more we could do for you. Your lungs were very sick and your heart was not functioning properly. We wanted to save you from further suffering, because you did not deserve that. You had your last injection ... we were with you all the way.